At just 29 years of age, Brenda Brent had her world turned upside down. Her kidneys stopped working and she had to start dialysis just to stay alive. Her hope now is for a lifesaving kidney transplant that will return her to good health but the cost is enormous. Brenda earned two degrees at the Gillette Community College in 2007 and 2009 both in Elementary Education. 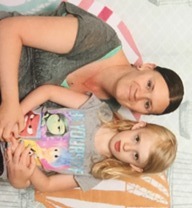 In 2010 she had to quit her job to have her beautiful little girl, Makayla and became a stay-at-home mom for her daughter who has some developmental delays. To see Brenda, you might think she is in perfect health and she does try to stay as healthy as she possibly can by bowling, a form of exercise for her. In reality, Brenda’s schedule includes dialysis three days a week/three hours each time. Though this treatment keeps her alive, it also steals her energy making it a real challenge to keep up with her daughter. Through the daily support of her longtime boyfriend David, Brenda is able to scrape by emotionally and financially but day-to-day she feels overwhelmed. Brenda needs our support. Brenda has now been on dialysis for three years. Fortunately, she is listed and is waiting for a kidney transplant at the Sanford Transplant Center in Sioux Falls. While her insurance is adequate to meet most of her medical bills, it will not cover her travel to and from the center, lodging and temporary relocation expenses at the time of transplant and for many months after that. Her uncovered transplant expenses could easily amount to $15,000 or more over the next year. To help with the financial burden of Brenda’s uninsured expenses, a fundraising campaign in her honor has been established with Help Hope Live, a trusted nonprofit organization that has been providing community-based fundraising guidance to patients and their families for more than 30 years. All donations are tax-deductible to the full extent allowed by law, are held by Help Hope Live in the Midwest/West Kidney Transplant Fund, and are administered by Help Hope Live for transplant-related expenses only. Please, consider a contribution. Your support of Brenda both financially and through your prayers, offer her, her young daughter and significant other, hope for a bright future. On Friday the 20th of April I had my life saving kidney transplant. I am doing good so far and may b getting to go to the patient housing today super excited. I know I haven’t been on in awhile. I have been busy trying to come up with some new ideas to raise funds. I have also been sick but am feeling much better. Next month I will be meeting with the University of Utah transplant team we hope the weather will allow us with good travels and good weather. We are still continuing to work hard on fundraising. Bowling is just around the corner and am excited to have that as my exercise for the fall. I have been taking walks with my boyfriend and our daughter at night. My yard sale/bake sale didn’t turn out so well in May as I had it on the wrong weekend, Memorial Weekend, so we are continuing our coin banks around town and working on thinking of more fundraisers to have. I have a few friends thinking of some fundraisers as well. We just had our first bake sale yesterday and it went better then I thought it would. We are continuing to fundraise and think of ideas to have more fundraisers. The final results for Women’s City are: Our team took first place for handicap and I took all events handicap!! I am super excited about this because I have never won for Women’s City before so this is a big accomplishment for me. I have won in the Men’s City Tournament in the past. So in April I will go to the bowling banquet and will receive a jacket along with my teammates for winning team, my all events should be on my jacket as well. Can’t wait super excited!! My daughter is doing well with selling her cookies she set a high goal but I don’t think we will come close to what she wants to really get. She will be doing a derby car for Girl Scouts and in April will be able to race with the boy scouts! Just bowled Women’s City Tournament, the team event last night and I had two games under average and one way over average. I have been bowling since I was 5 years old and have come a long way to get to where I am now. The doctors say that bowling is good for me because it is my form of exercise in the fall and to continue bowling. Right now I bowl on two leagues a mixed league and a women’s league and on the mixed league I hold an average of a 163 I think. I set goals every fall for myself and although I may not hit all of them I do keep trying. Saturday I will be finishing up Women’s City Tournament with the singles/doubles event. I hope to do well. Hey sis I know things have been hard but I know u are strong and u will make it through this keep your head up and keep trying your best to do what u need to and everything will work out I am praying for u love you always !! My Darling Daughter, there have been many kind & giving "Angels" out there! We're doing a good job, thus far, raising funds! One day at a time...Everyday is a new day! If you can imagine it... You can achieve it! I Love You! Hey Sis! We love you! We will be home soon! Stay strong and keep your head up! Brenda,My Darling Daughter, Tom & I are praying that there's an Angel out there that will donate a kidney to you. Stay strong & believe that miracles can happen! We Love You very much!